Let’s Predict the Next ‘Voice’ Finalists! The Voice is a very successful show that runs in 28 countries around the globe. The basic concept in each version is the same: Four famous singers act as coaches. They have to select a team of vocalists through an audition process. The teams compete internally through a process of competitive elimination, until one vocalist per coach enters the Finals. There, the best vocalist of the four is declared ‘The Voice of …’ (insert country). In the audition part of the season, the coaches must make a decision on whether or not to take the vocalist on their team. But, there’s a catch: Their backs are turned towards the stage. They must make a decision based solely on the quality of the voice, and the public’s reaction. Pushing a big button in front of the coach means “I want you on my team” and will result in the coach’s chair turning towards the participant. When more than one coach turns, it’s the participant’s choice. Auditions take 100 seconds at most. No coaches turned means an early exit. The various elemination rounds are (in order): Battle rounds (which deletes up to 50% of the participants), three Live concert rounds, a Semi Final and a Final. Starting at the live rounds, the viewers are invited to vote for their favorite act, giving the public a decisive vote in elimination and survival. Some participants have such a distinctive sound and performance that all four coaches turn literally within seconds after the person starts to sing. For others there’s no reaction until the very last second of the audition, when one coach decides to take a chance. So how much does that matter for your chances of reaching a next round? Surely, having four coaches turn their chairs within ten seconds must mean a better act and therefore more success than a hesitant, last second decision? As always, let’s look at the data! 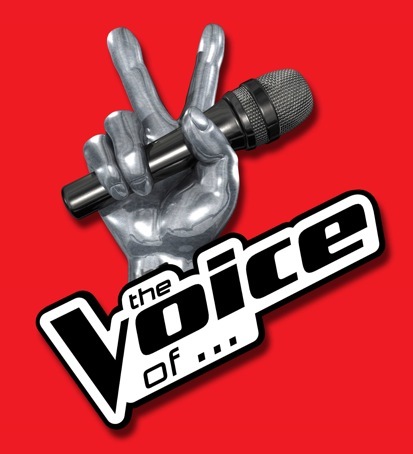 I collected data from five editions of The Voice: The Voice of Holland edition 2010 and 2011, The Voice of Flanders (Belgium) 2011, The Voice US 2011 and the Voice UK 2012. For every contestant I checked how long it took the various coaches to turn after the person started to sing. If more than one coach turned, I calculated the time between the first and the last coach turning, indicating the level of agreement between the coaches. Empty fields (no second, third and/or fourth coach turned) were given a maximum value of 180 seconds. So with that in mind can you predict who makes it to which round of your next edition of ‘The Voice’? To survive the Battles and make it to the live concerts, having at least two coaches turning within 58 seconds gives you a good start. To make it to the second live rounds, having a third coach turn within 37 seconds is important. If two coaches turn within 10 seconds after you start singing, you have a head start to make it all the way to live round three. Semi Finals? Have at least three coaches turn within 9 seconds and all of that with no more than two seconds from first to last coach. Or have the third coach turn within 12 seconds. Finally, what gives you a good chance of making it to the finals? If all coaches turn within 16 seconds. 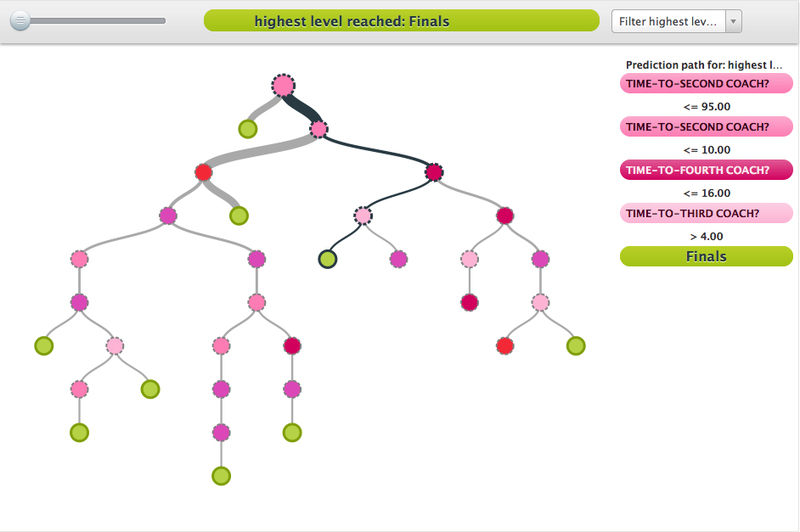 Of course there are numerous exceptions, so you’d have to use the full model to make more accurate predictions. Ben Saunders, winner of the very first The Voice (of Holland, 2010) made three coaches turn within three seconds after he started singing. The fourth one came in at 58 seconds. And Tyler James, finalist and runner up for The Voice UK 2012 had immense trouble turning a single coach until Will.i.am made a last second decision 93 seconds into Tyler’s audition! In fact, the winner of The Voice UK 2012, Leanne Mitchell, made (only) two coaches turn for her audition, both at 48 seconds into the song. But as a general rule, the more coaches turn and the faster they turn, the more rounds you are likely to survive. 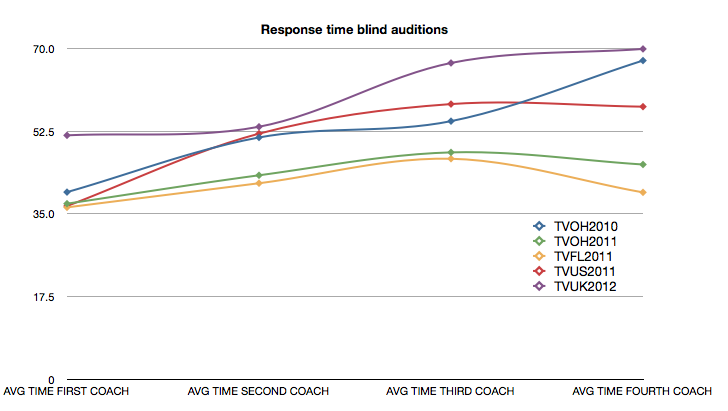 The UK coaches are by far the slowest responding coaches: their average time to first response was 52 seconds while in all other editions it took between 36-40 seconds on average. The Flemish coaches are the most enthusiastic with a top score at every stage. In the Flemish edition, half of the contestants managed to raise the interest of three coaches – almost twice as much as in the UK edition, where only 28% of the performers could turn 3 chairs. Charly Luske, edition the Voice of Holland 2011, holds the speed record: He managed to turn all four coaches in only three seconds. Turning four coaches during your audition by no means guarantees success: 40% of these contestants never made it through the next round. On the other hand, having only 1 coach respond to your audition leaves you with a 75% chance of elimination in the first Battle round. Can we predict the Winner? That is very tricky. First of all, while the auditions are determined by the expertise of coaches, the results of the Finals are fully determined by public voting. Secondly, with only five editions and less than 300 lines to build a model from, confidence levels are falling very low. And overall, it is up to the vocalist to win the hearts of the public with stunning performances and a clever use of the PR-machine that is called ‘The Voice’.